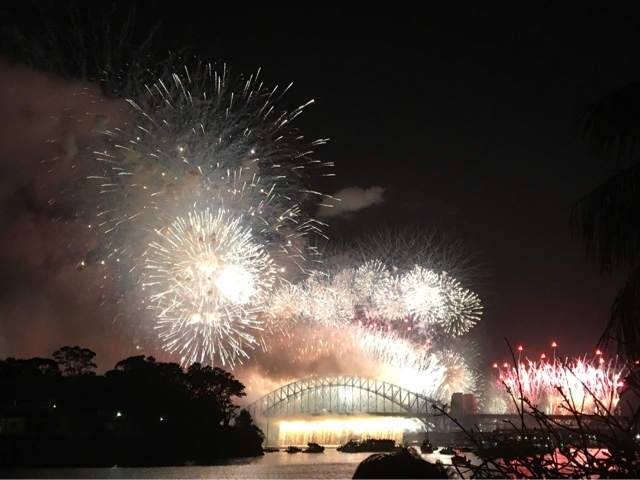 Happy New Year from Sydney, Australia to all my blogging friends in New Zealand who have just tipped over into 2017! 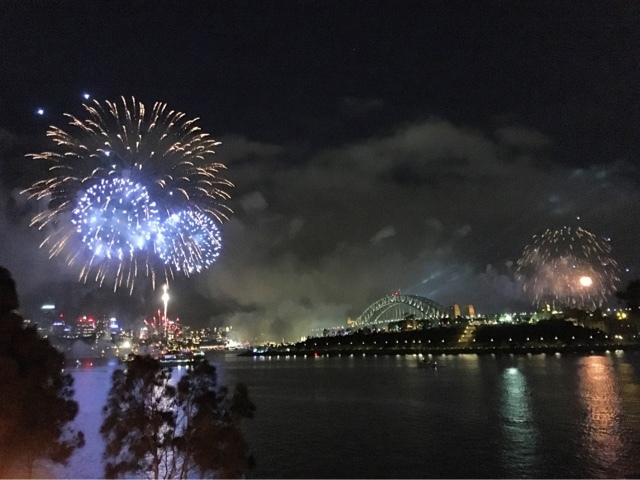 The 9pm fireworks in Sydney are smaller than the more famous midnight ones, but they're great for families. All the harbour pontoons synchronise their displays, so that fireworks light up the sky all around the various coves and bays of the city. Our Inner West suburb is dotted with wonderful viewing spots. We haven't been here for years to celebrate NYE - I'd forgotten how exciting it is. The suburb is closed off at lunch time, so that only residents can drive in. All the parks start to fill up with families about 8.30pm. Parties seem to ooze out of every second house to watch the fireworks. Everyone oooh's and aahhh's, a few young children cry, we all applaud at the end. Then everyone takes the kids back home and put them all to bed. The parties continue, the young adults start arriving, the pubs fill up, party boats dooff dooff around the harbour & Mr Seasons & I meander home to put our feet up under the air con, with a beer in hand & watch the Robbie Williams in Talinn concert until it's time to meander back to our secret viewing spot for the midnight display. Pop back just after midnight for some pics of the big display! WOW! The midnight display is always so much better in real life than the TV. It's nice to have the occasional Christmas and NY at home so that we can enjoy these fabulous Sydney events up close and personal. All the the booklets are home safe and sound now, so I'm off to bed. Happy New Year one and all, whatever your time zone, may your new year be joyous, healthy and full of grace. Happy New Year! I hope this will be a lovely year, full of happy surprises. Lovely photos of a magnificent display. Worth staying up for! I'm looking forward to more of your pictures in the coming year. 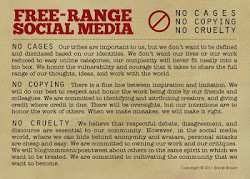 Thank you for visiting my blog today and leaving a comment. Great pictures! I've never had much luck taking pictures of fireworks, so I'm impressed. Happy New Year!